I never really got into running to be fast or win races – I’m far too slow for that. What I do love is an adventure which is why I very rarely venture out onto the roads. I love the trails and the freedom you have to explore and go at your own pace and often your own way. But it’s this freedom to choose your own way that got me into a bit of a pickle within the last few miles of Borrowdale Fell Race. Borrowdale is one of the classic long Lake District fell races and the race that inspired me to take up fell and trail running. In the start field just off the main road in the village of Rosthwaite deep in the Borrowdale valley, I stood waiting patiently for the start of the race. Around me, as per usual, are the skeleton-like bodies of the local fell runners. There’s also the stars of the genre gathered – Ricky Lightfoot, Carl Bell, Nicky Spinks and Jasmine Paris to name but a few. 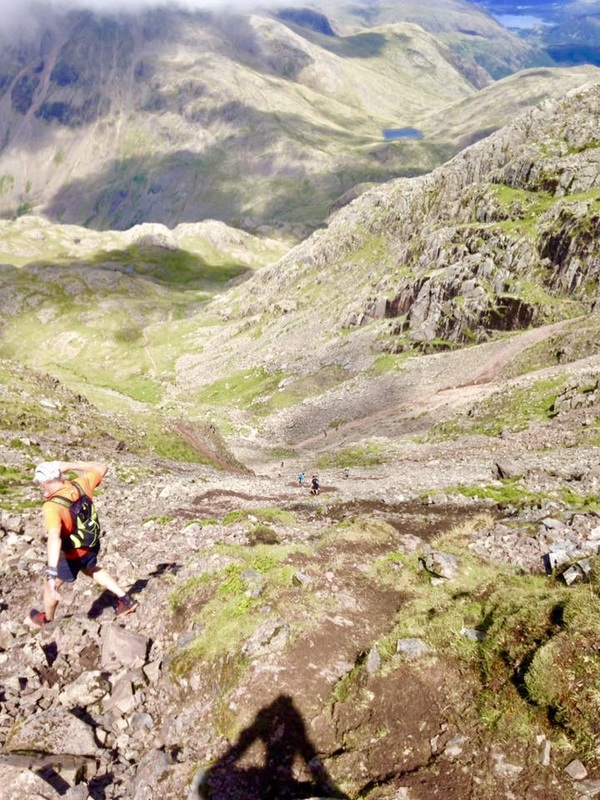 The route is approximately 17 miles and totals around 2000 metres of climbing across some of England’s roughest terrain and its highest peak, Scafell Pike. 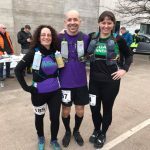 With kit checked, the 250 plus runners shuffled forward, and following a short word from the race director, we were off. I took up my place towards the back of the field, keen to take it easy along the valley and through the farms before the tough climbs begin. The field stretched out before me in a long line, the front runners making the most of the shallow incline and single-track to make progress on the rest of the pack. 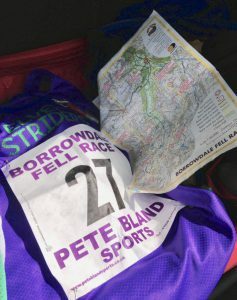 Before long the route takes a sudden and sharp turn beyond a gate which is, once again, being held open by fell running legend and Borrowdale resident, Billy Bland. From here it’s a head down, hands on knees march up the incredibly steep slope to the first peak and checkpoint at BessyBoot. I take my time as my biggest weakness is climbing; I just haven’t got the lungs for it. But this is a race and there’s a balance to be had between taking your time and beating the cut-offs which are strictly enforced. 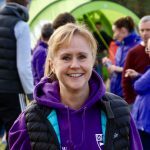 Although my progress is slow, I’m still moving well but I’ve lost a lot of ground on other runners who I’ve come to recognise in these races. The summit of BessyBoot seems to take an age to reach, but once there I check-in then make my way off to try and catch up some of the ground lost on the climb. The next section is a roller coaster of ups and downs. It’s surprisingly boggy in parts given how dry it’s been but nothing like in previous years where there was a real danger of being sucked in up to your waist. The route skirts around the back of Rosthwaite Fell and under the peak of Glaramara, the steep slopes of Stonethwaite Fell add to the jeopardy of a misplaced step to my left. I’d forgotten just how long and tough this section can be, my breathing is heavy and legs are working hard to keep up any kind of pace. The sun is beating down but over to the north across the summits of the Gables, there’s a thick mist hanging ominously. 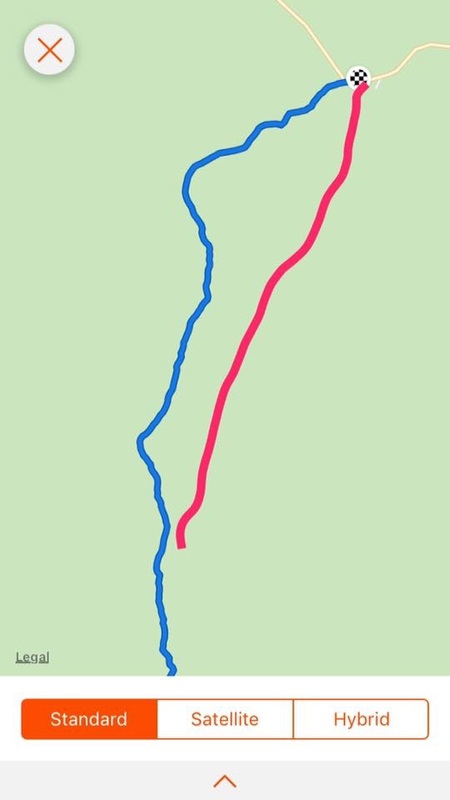 Soon, I reach the col around Allen Crag and pick up the path to the second checkpoint at Esk Hause. From here you join the hoards of walkers making their way to the summit of Scafell Pike. But fell running is about efficiency and direct lines so the most direct route took me off the well-worn path and straight up across more rocky ground that cuts out a more commonly used path from Great End to Broad Crag. The previous weekend I’d been here supporting a Bob Graham round. The weather was foul and with almost no visibility and winds that forced us to stop and sit for moments, it had been a tough slog. Today was the total opposite, with blue skies, warm temperatures and good visibility all around. I made the most of this and was happy to be making my way over the boulder field towards Scafell. There’s a steep drop then a solid climb to the summit but I was moving well and was relieved to finally reach the summit checkpoint which was teaming with walkers. There were glorious views to be had but that mist still hung ominously over the Gables. From here the real fun part of the race begins – the direct drop down the scree slope to the Corridor route. As fun as it is, it’s still incredibly tough and quite dangerous, not so much to me, but to those below and the danger of dislodging rocks that could roll down onto them. Once at the bottom, I took the time to empty my shoes which had filled with stones on the descent. Whilst doing so, I was struck with cramp in my right calf trying to get my shoe back on. This was not good and set me back a little. Once I’d recovered I began my quest to get to the next checkpoint at Styhead Tarn as quickly as possible. Here is the first point where you can be timed out. 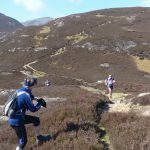 The problem with this one is that you’re still at around 500 metres above sea level and around 2 miles of rough ground from the nearest road so it’s not a good place to be dragged off the course. 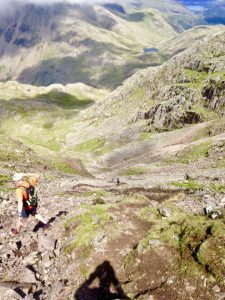 Taking the runners line off the Corridor route, I eventually made it to the checkpoint, grabbed a few jelly babies form the marshal and set off for the steep and unrelenting climb to the summit of Great Gable. I was still moving well but fully aware that I was pressed for time. I was now in the cloud that had been hanging over the Gables for most of the day. It was cold and damp and a stark contrast to the warmth and sun I’d enjoyed in the start of the race. Once again my weakness in climbing was laid bare as runners around me started to pull away but I knew that if I just kept going I’d be ok. Eventually, after what seemed an age, I reached the summit and the checkpoint, dibbed my dabber and made off. The mist was thick and visibility was very low. My glasses were covered in dew which made seeing quite difficult. I was on my own now, I couldn’t see anyone else, runners or walkers, but knew where I was heading, down and back up Windy Gap and skirting below Green Gable and on towards Brandreth. From here it’s across open ground to Grey Knotts to cut through for a direct descent to Honister Slate mine. Sounds easy, it is easy, but the thick mist and my increasing fatigue played a trick on me and instead of taking the path that would have led to the right of Grey Knott, I took the line that swung me out left. As I ran I got the feeling something wasn’t right. I stopped and checked the map but because of the lack of visibility, I was unsure as to exactly where I was so I pressed on. Descending out of the mist it became apparent I was on the wrong side of the peak. I’d gone too far to turn back and knew that I had to keep moving forward as I was now seriously under pressure to reach the last checkpoint before the cut-off. 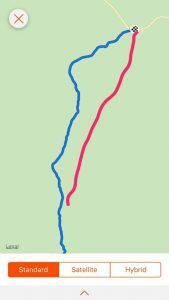 Blue line is my route, the red line is where I should have gone. Cursing my mistake, I made the descent off the high ground down the grassy slopes. To my left, there was the path that led back down to the slate mine, but I choose to keep moving right and try and get back on to the more direct line that I should have been on. Eventually, I made it back on track but knew that I was probably too late to continue beyond the checkpoint. Once at Honister, I marched up to the marshal who informed me that my race was over. I’d missed the cut-off by 5 minutes. I was gutted but not surprised. I’d been running tight to the cut-offs and my navigation mistake cost me what time I did have. After around five minutes I was given a lift back to the finish where I handing in my race number and dibber. I’ve never been timed out in a race before so it was a strange feeling but one that I have to accept. Had it not been for that simple mistake I’d have gotten around, probably last, but finished none the less. But this is why I love the trails, there’s a sense of adventure and jeopardy. Part of the race was bathed in sunshine and glorious views, the other half thick mist and cold temperatures. 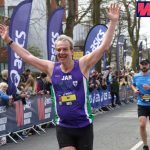 I’ll be back next year with the aim of being more competitive – but then again, I said that that last time I ran this race and ended up doing worse!